First watch brand to commit alongside the Monaco Association against Muscular Dystrophy, Blancpain is renewing its support this year by presenting a unique model from its Women collection. This watch specially created for the Only Watch 2013 charity auction will travel the world before going under the hammer in Monaco on September 28th. This biennial auction is placed under the patronage of His Most Serene Highness Prince Albert II of Monaco. In 2013, it will feature over 30 exceptional timepieces created by the most prestigious watch companies. As of September 6th, the travelling exhibition will tour the world before the Monaco auction on September 28th morning. The funds raised will be entirely donated to support medical research on Duchenne Muscular Dystrophy, a degenerative neuromuscular disease. Blancpain has been lending its unfailing support to this cause since 2001 when it became the first watch brand to back the AMM. For over 10 years, the Manufacture from Le Brassus has joined in the struggle and taken part in the various operations organised by the association. This year, for the fifth edition of Only Watch, the brand is unveiling a unique creation stemming for the first time from its Women collection. This one-of-a-kind model combines mother-of-pearl marquetry, diamonds and engraving in a delightfully feminine watch equipped with a self-winding movement. On the dial, a white mother-of-pearl dove flies across a blue mother-of-pearl sky. With 12 diamonds hour-markers set around the dial, the watch radiates a feminine aura of elegance. 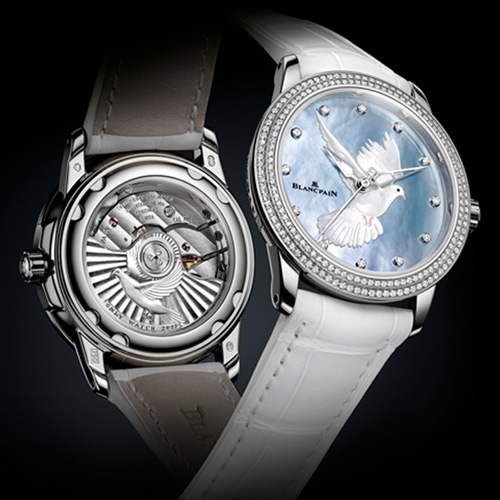 A glance through the sapphire crystal case-back offers a chance to appreciate the decorative work on the oscillating weight bearing a dove engraving and the inscription ONLY WATCH 2013, like an anthem to life. This watch water-resistant to 3 bar is fitted with a white alligator leather strap and a folding clasp.